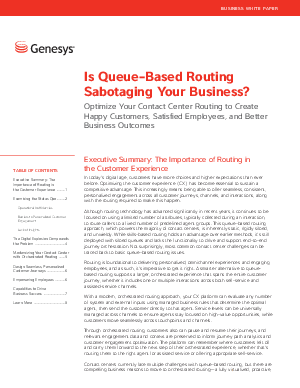 > Genesys > White Paper: Is Queue-Based Routing Sabotaging Your Contact Center? Queue-based routing was the model of efficiency when it was first introduced 40+ years ago. With the addition of digital and self-service channels, and with customers using multiple channels (sometimes within a single interaction), contact centers are now constrained by this approach. Contact center routing is the foundation for delivering personalized, omnichannel customer experiences and engaging employees. It’s time to rethink the status quo for routing work to the best-suited employee.